Thormar is an Ayleid ruin in southern Reaper's March, east of the Do'Krin Monastery. 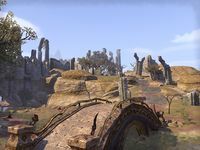 The Battle of Thormar between Bosmeri and Khajiiti troops took place here. The leader of the Khajiiti, Yenamu Frost-Fist, a powerful ice mage fell to an arrow shot by an unknown Bosmer. The projectile struck her through the eye, killing the sorcerer and winning the battle for the Bosmeri side. Thormar Objective: Earn your way into the Five Finger Dance.